This is getting interesting. If nothing else there is now a chance that Brock Lesnar holds the WWE’s most prestigious title when he returns to the UFC. Today (Nov. 2) at WWE Crown Jewel in Saudi Arabia, Brock Lesnar captured the WWE’s Universal title. By pro wrestling standards, the match was nothing to write home about. Lesnar didn’t do much and his opponent Braun Strowman may have come off looking better in the end. This is the second time Lesnar has held the WWE’s Universal title. The last time Brock got a run with the belt, he had it for over year. After winning the Universal title in April 2017, the former UFC heavyweight champion held onto to it until August 2018. Brock is the exception to every rule but this is like John Cena fighting Chuck Liddell in the UFC or Mark Coleman fighting Stone Cold Steve Austin in Pride. You thought 2017 and 2018 was wild for combat sports? Let’s have a WWE champion take on an UFC champion inside a cage. This has the potential to be pure chaos if WWE follows through with it. Let’s promote the match on Monday Night Raw one night then on ESPN the next night. 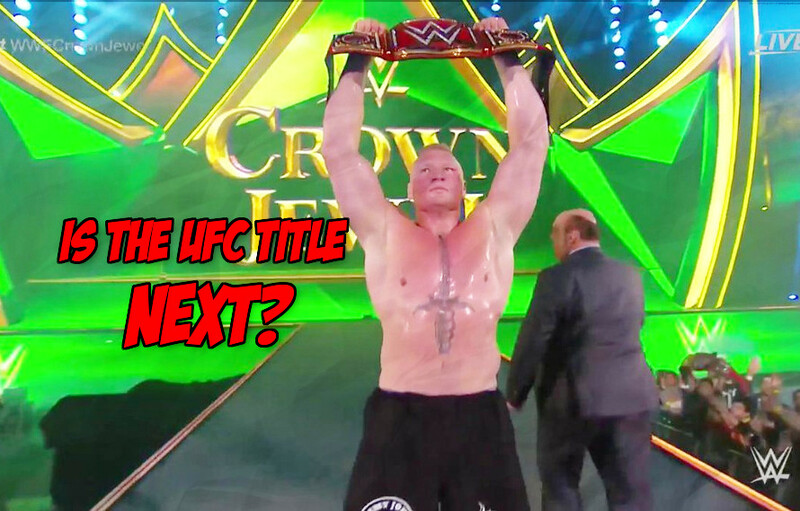 Now who gets to face Brock Lesnar in his return to the UFC? Is it still Daniel Cormier? Maybe Jon Jones? Let’s just get insane and have Derrick Lewis feud with Brock in the WWE and the UFC.